Bocayna Express has a passenger capacity of 450 and can hold up to 69 cars in its garage. On board facilities include , boutiques, bars, and large well-lit lounges - all air-conditioned. In addition, the sun decks afford passengers the opportunity to enjoy the sun and the sea, transforming their crossing into a mini pleasure cruise. Please Note: Whilst we have taken great care in making our Bocayna Express guide as accurate as possible, onboard facilities, services and entertainment may vary depending on the date and time of year that you travel, facilities mentioned may change without notification and ferry companies reserve the right to operate vessels other than those mentioned at time of booking without prior notification. Booked and paid a long time before the actual crossing. No problems for times, services, and comfort. Recommend it. A fast and efficient service. Helpful crew at boarding point and on board ship. Availability of snacks and toilet facilities on board. Everything was perfect. Easy booking online, punctuality, kindness, comfort. 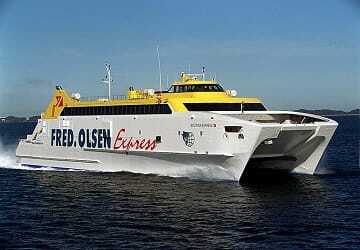 Trip canceled because of the weather and the Fred Olsen rifiused to refund the ticket. Direct Ferries showed high professionality and has remedied. Since two ferries travel between Playa Blanca and Corralejo they should be better signposted in Playa Blanca! It is recommended that you are in the harbour 45 min before departure, why? In daytime no ferry arrives until a quarter before departure. In Playa Blanca no cashier opened until 15 min before. A long queue appeared. In Corralejo everything worked allright. The crossing was allright although we had a little windy weather on our way back. But only one of the passengers threw up. We flew to Fuerteventura and spent a few days in Corralejo then had the rest of our holiday in Lanzarote as flights worked out cheaper and more convenient this way. Taking the ferry to Playa Blanca added an extra dimension to our holiday. The whole process - from booking online before we went, picking up tickets and sailing - was smooth and trouble-free. The boat was immaculate and as it was a calm and sunny day, we sat out on the stern deck, getting lovely views of Los Lobos island as we sailed past. Twenty five minutes from leaving Corralejo, we were in Playa Blanca. I would definitely recommend this ferry crossing. "from playa blanca to corralejo"
"went to lanzarote ... big 4x4, even had my bike mounted on the roof ... was still a pleasure and eas"
Good service, clean ship, good experience. We travelled to Fuerteventura with Fred Olsen. Check-in and boarding went smoothly. Facilities on board were excellent and included a bar and luxury seats. The seats on the open deck were also very nice. It would be nice if the staff on the deck spoke English. Everything including the parking bords was in spanish. This was the only negative point. "A very good crossing with this company"
It is a very serious company. The quality of the service is good and the staff is welcoming. "First time with Fred Olsen"
Not being a good traveller by sea but wanting to experience another Canary Island our party decided to try Fred Olsen ferries. What a surprise we had to find the experience both easy and smooth and the ferry was remarkably clean with friendly staff we will certainly use Fred Olsen ferries again. Quality prestations and reliable timing. Nothing to add.